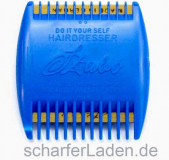 Szabo Hairdresser (Haircutter) incl. 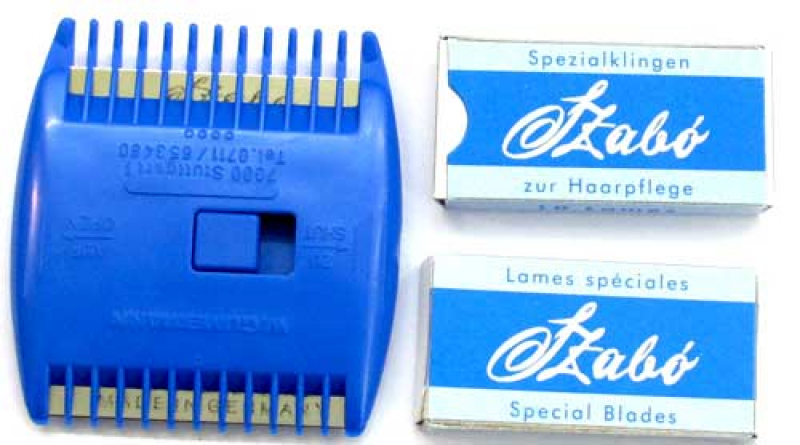 20 razor blades. 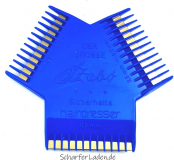 The Szabo Haircutters can be opened to change blades by applying slight pressure to the right toward AUF / OPEN. The stainless steel blades are ground on both sides. After about 5 complete haircuts they should be turned around, and after the next 5 haircuts exchanged against new blades. The blades will have a longer service life if you sharpen them on the ball of your thumb occasionally. 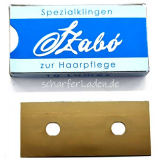 Draw the Szabo at a slight angle through your hair without applying any pressure: if you have thick, long hair set at OOOO, otherwise adjust to OOO, OO or O. "long hair - long teeth"
"short hair - short teeth"
Each row of teeth is distinguished by its rings. When cutting your hair, the Szabo should always be held so that the rings face you hair. - signifies the least cutting depth. - is used for thinning. The lessened cutting depth thins hair which is too thick, evenly. - is for cutting the transition: the clean fashion cut on the temples, the cut of the hair-line on your neck. And - if you have dampened your hair - the razor cut. - is for tyding the nape of the neck and the hair-line on the temples.